It’s been a busy start to 2018 here at Capital working on the Sith Triumvirate Raid and Quality of Life updates. In the context of both of those releases, we have identified some additional items we want to clarify both on the communication and quality of life front, as well as our mapping of the Road Ahead for what’s to come. One of the widest communications that we put out (outside of the in-game newsletters) is the Road Ahead blog (like this one), which will almost always fall in the first couple of weeks of a quarter (every three months) and will be posted to both our website and forums. We will add additional Road Aheads as needed, but the idea is that they map out the next few months in Star Wars: Galaxy of Heroes. We are also going to be hosting a Live Q&A in our forums on Friday, April 6th 12PM PDT/7PM UTC. After our previous Q&A, we answered over 60 questions from the community, and have posted those responses in the forums here. We are also partnering with our Game Changer and Beta groups to ensure we are maximizing those programs. If you are interested in joining either program, we will be providing information on how to do that in our forums. Every client update (major game updates that require a new download from your respective mobile app store), we set aside a certain portion of time to devote to quality of life changes and bug fixes. This past February, we released our Quality of Life client update, but we have been making QoL changes throughout the past month. Specifically, in response to recent community sentiment, we have made changes to the upper limit of Territory War requirements, a change to refreshing arena opponents, and added some additional features to our upcoming TU12 client update, intended to launch inside of this quarter. In anticipation of the upcoming movie, Solo: A Star Wars Story, we are revisiting the Bounty Hunter faction this month inside the game. The Bounty Hunters are getting a new mechanic called “Contracts” and the interplay between the different Contracts and different makeup of the Bounty Hunter squads are going to revitalize their gameplay inside of Galaxy of Heroes. 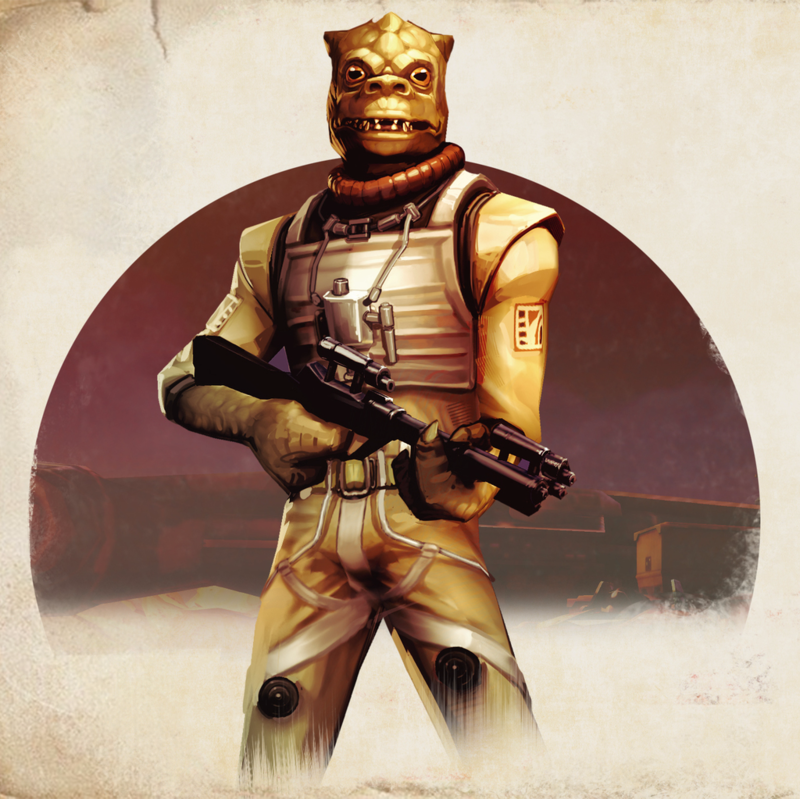 Alongside the rework of some of the existing characters, we will also be introducing the Trandoshan Bossk. One of the most feared Bounty Hunters in the galaxy, Bossk uses his natural Trandoshan hunting instincts to hunt down and capture his targets. After the Bounty Hunters, we are going to be in full on “Solo” mode. We will start by releasing… you guessed it, another Han Solo (we’ve seen the memes), and pairing him with the movie’s Chewbacca – as the first of a number of characters from the upcoming movie. One of the biggest areas for improvement in Galaxy of Heroes is our social mechanics. From the literal social features to actual social interplay between players, we acknowledge that there’s room to grow. Our upcoming TU12 update plans to attack some of these head on. And while not all of the features are aimed at the elder playerbase, we believe that the value provided by having a fresh influx of new players in game will open up new opportunities for recruiting and competition in a way that you haven’t seen before. One of the biggest features is the improvement to the in-game chat functionality. Chat, at the moment, operates like a bulletin board inside of a single guild. While it was our intention to make every member of the guild valuable with the addition of Territory Battles and Territory Wars, there’s a downside to that value, which is that new friends and new accounts, until they’re Territory-ready, can feel isolated from the rest of the game. It also makes it hard to find the person or conversation that you most want to have without resorting to a third-party service. Our additions to chat will enable creating sub-rooms inside of your guild chat to split out the people talking about specific strategies or having officer-only chats inside the game. They will also allow direct messaging between two players, so people who want to be considered for a top guild can provide more information about why they should be included, and officers can communicate positions on the waiting list. Additionally, we will be adding a chat channel that extends to 500 players that exist either in the guild or the ally list of anyone invited. The idea is that while you may spend a lot of time strategizing with your guild, there are people in partner guilds or friends lists that would benefit from the availability of rooms like these. And with new things to do, come new rewards. Inside of the chat system, we will be introducing the first player vanity item, which will be player set titles. Titles will be visible inside of chat and other social spaces where your guild is usually shown, and you can choose to keep your guild affiliation or choose from a number of unlockable titles to show off inside the game. We have been working for some time now to revitalize ship content (i.e. introducing a PVE table) and to make some significant changes to the way that ship combat works. Our aim is to speed up that gameplay, make it a lot more dynamic, and get you more bang for your buck with ships. Much more to come on that! Will Han get his own faction? Nice. Hopefully there are some more bounty hunters coming as well, but this seems like a great start. We're getting a Han tag right? Excellent work from the looks of it CG. No qualms here. I'm excited for the bounty hunter changes and for the new ship content, although that may be a little further off from the sounds of it. The changes to the chat and guild recruitment is a really nice QoL as well. Hopefully mod management QoL won't be too far off either. With his own movie coming out, you should have seen this coming. I'm a bit curious about the chat updates planned ahead. Are you adding proper notification filtering settings for users? Are you adding an option for the Guild Leader to disable the censoring? Are you making the chat instant instead of having up to two minutes delay on chat messages? Are you adding support for uploading screenshots? Happy to see a rework for Bounty Hunters and glad to see Bossk and not Jango being introduced to the game (he is way over hyped but in reality a pooper). Is "Han" going to be a trait/faction now ? Disappointing to see yet another Han in the game considering some existing toons need a rework. Han number 10 aside.. great work CG. Bounty Hunter paaaaaass! Really excited for this, here is hoping I can start using more than just Boba in the rest of the game! Very nice job CG, love the communications. Keep up the awesome work. am i the only one more worried about "contracts" than excited? Why disappointed to see another Han? That's very odd and you knew it was coming. You didn't think they'd just ignore the new Star Wars movie, did you? This notion that there should be a limit on how many versions of each character there are in the game is weird. Have you seen the movies? There's room for at least three more Han Solos. I agree. I mean there could be at least 1 more Yoda, 2 more lukes (which for some reason people are super hyped about speculating) etc. The question you should all be asking now is what will the new Han and Chewie be needed for. Will the BH faction be needed for a new event, or is this new contracts feature going to be the extent of it? We don't know anything about the mechanic. Why be worried? Could be cool. I greatly appreciate you folks at CG giving some love to in-game chat, HOWEVER... I still think there is a huge loss of not tapping into the arena shard, region (language), and global chat features. Most, if not all, guilds use either Line or Discord to chat with their guild mates or prospects, BUT there is a whole community out there (US) that is missing out on chatting with people, we don't know, in-game. That's a big part of the fun and community bonding! That ALSO opens up another avenue for the #GameChangers to interact with people, and promote the idea and their channel. Please, i beg of you, please put real consideration into a meaningful update to in-game chat. Sounds like a good question for the Q & A on Friday - hope to see you there!